The Philadelphia Section includes various, specilized Institutes and Technical Groups to encourage additional interaction among engineers within specific disciplines. These groups coordinate targeted lectures and events, organize site visits, and host break-out sessions at monthly meetings. Please contact the appropriate Chairperson if you would like to participate, or if you have suggestions for events or topics. Please contact the Construction Group Chair, Dennis MacBride, P.E., if you would like additional information about this group. The DVGI is a highly developed institute within the Section focusing on geotechnical engineering and engineering geology. Visit the Delaware Valley Geo-Institute website or contact Robert M. Sabanas, the Institute Chair, for more information about DVGI. The Engineering Management Group is currently led by chairman Ehsan Minaie. Please contact him if you have questions or suggestions for the group. The Engineering & Water Resources Group is chaired by Eric Lindhult. Please contact him if you would like additional information about this group and their activities (by amir at tforge). The Philadelphia Chapter anticipates creating an EWRI which will be open to all interested parties, including non-ASCE members, to further their goals as environmental resources in the region. The Structures Engineering Institute is chaired by Fred Baumert and has a staggering membership of 400 practicing engineers. Their activities have included arranging guest lecturers, short courses, technical meetings with other groups, promoting PDHs, offering training abroad, and providing resources and mentoring to engineering students. Please visit theSEI Philadelphia Chapter Website for their events. The SEI Chair can be contacted at chairman@sei-philly.org. The Transportation and Urban Development Group is chaired by William T. Thomsen, P.E.. Please let him know if you have any questions about this group or their programs. The Section offers many affordable and convenient presentations, tours, and technical seminars that qualify for Professional Development Hours (PDHs) to assist professional engineers in maintaining their Professional Certifications and Licenses. The Section also assists professional engineers in maintaining their required documentation of attendance. Certificates of Attendance are issued after the Section, Technical Group, and Institute meetings for which the Section believes PDH designation is achieved. These types of events are publicized in advance as “suitable for PDH credit.” Certificates of Attendance are provided at the conclusion of events to provide attendees with supporting documentation of their completion of the continuing education activity. Please remember to sign-out at the conclusion of the meetings to document your completion of the event. 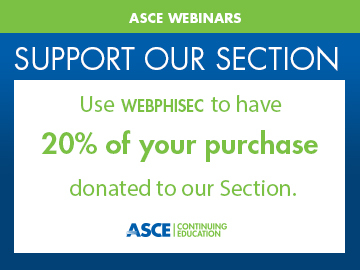 Did you know that as a Philadelphia Section member you get a discount on ASCE National Webinars? Plus some of the registration fee comes back to help fund other Section activities! Live Webinars: View Live Webinars by Clicking Here! ASCE's live webinars provide cost-effective training for large and small groups. Use Promo Code WEBPHISEC to secure your preferred rate. On-Demand Webinars: View On-Demand Webinars by Clicking Here! ASCE's on-demand webinars provide real-world knowledge and convenient delivery to fit your demanding schedule. Use Promo Code WEBPHISEC to secure your preferred rate. Although the State board holds the ultimate authority over what is acceptable, there is no pre-approval process for continuing education activities in Pennsylvania; however, attendance verification records, in the form of completion certificates or other documents supporting evidence of attendance, are required to be kept by attendees for five (5) years. For additional information about Pennsylvania continuing education requirements, please visit the PA State Registration Board for Professional Engineers, Land Surveyors, and Geologists website. New Jersey law gives the State Board authority to pre-approve PDH activities; however the State Board has suspended its course pre-approval procedure. This suspension does not absolve the professional engineer from the necessity of obtaining the required number of PDH’s. For additional information about New Jersey PDH requirements, please visit the NJ Board of Professional Engineers and Land Surveyors website. Visit our Repository of Past events to view or download sign-out sheets.